Laugh It Up, Fuzzball: The Family Guy Trilogy consists of three episode specials of the American animated sitcom Family Guy. The episodes are a crossover and parody retelling of the original Star Wars trilogy Star Wars (1977), The Empire Strikes Back (1980), and Return of the Jedi (1983). The first episode, "Blue Harvest" (2007) was created in honor of the original film's 30th anniversary. Due to its popular success, it was followed by two direct-to-video sequels: "Something, Something, Something, Dark Side" (Season 8, Episode 20) and "It's a Trap!" (Season 9, Episode 18), which were subsequently aired on television, in edited versions, omitting most profanity and sexual references. The trilogy was released on Blu-ray and DVD in the United States on December 21, 2010. Its title comes from an insult Han Solo said to Chewbacca in The Empire Strikes Back. 3.2 "Something, Something, Something, Dark Side"
During power outages, Peter Griffin tells his family the stories of the original Star Wars trilogy films, with characters from Family Guy, The Cleveland Show, and American Dad! playing the Star Wars roles. A running joke at the end of the first two episodes deals with Chris Griffin (voiced by Seth Green) criticizing Peter's take on Star Wars as a ripoff of Robot Chicken: Star Wars. In the third episode, Peter and Chris initially argue about Seth Green then move on to arguing about Seth MacFarlane which is when the rest of the family joins in and the characters voiced by Seth MacFarlane (Brian, Peter, and Stewie) quarrel with those who are not. Family Guy creator Seth MacFarlane served as executive producer for the trilogy. At the 2007 Comic Con, a series of clips was shown at a panel for Family Guy from the season premiere episode, showing the Family Guy characters as Star Wars characters. The episode aired on September 23, 2007, with some slight changes from the clips shown at Comic Con. 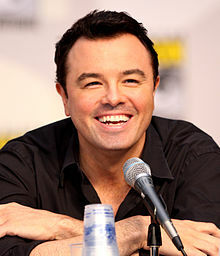 Parts of this episode were shown at Star Wars Celebration IV, at which Family Guy creator Seth MacFarlane, a Star Wars fan since childhood, was a special guest, and again at Comic-Con International 2007. The episode was officially endorsed by Lucasfilm, especially George Lucas, who revealed in his conversation with MacFarlane that he has TiVoed every single episode of Family Guy without having to buy the DVDs and, in addition to Jackass, it's the only show he watches. MacFarlane said they were extremely helpful when the Family Guy crew wanted to parody their works. The episode was written by series regular Kirker Butler, before the 2007–2008 Writers Guild of America strike, and before his leave from the series in order to become co-executive producer of the Family Guy spinoff series The Cleveland Show. Butler wrote the first draft of the episode in four weeks, under the guidance of series creator Seth MacFarlane. The episode was directed by Dominic Polcino, who had previously directed "Blue Harvest". This was the last episode in the series to use hand-drawn animatics, before transitioning to computer-designed animatics. Main article: It's a Trap! It was announced in March 2009 that the cast of the show had read through an early draft of the script under the working title, "Episode VI: The Great Muppet Caper". The second working title, "We Have a Bad Feeling About This," was a reference to the recurring catchphrase used in the Star Wars films. The settled-upon title is a reference to the line by Admiral Ackbar in the film. While the first and third episodes are "Region All", and therefore able to play on any Blu-ray player worldwide, "Something, Something, Something Dark Side" is region-locked, forcing viewers to buy the set marketed towards their own region if they don't own a multi-region Blu-ray player. A spoof of the Indiana Jones series was also considered for development, but has not received any updates concerning its production. ^ "The Force is With Family Guy". IGN. May 30, 2007. Retrieved 2007-09-24. ^ "Programming for Saturday July 28". Comic-Con. Archived from the original on October 1, 2007. Retrieved 2007-10-02. ^ Burton, Bonnie (September 21, 2007). ""Family Guy" Creator Reveals Star Wars Cred". Starwars.com. Archived from the original on September 5, 2011. Retrieved 2007-09-21. ^ "Family Guy to parody Return of the Jedi". thrfeed.com. 2009-03-04. Retrieved 2009-11-23. ^ "Blu ray Region Test: Family Guy Trilogy — interesting results". MovieTyme.com Blog. January 12, 2011. Retrieved 2011-01-20. This page was last edited on 5 March 2019, at 00:23 (UTC).